We all hate retargeting, right? Long after we've already purchased the shoes (or whatever) our feeds are still plastered with now irrelevant information. B2C searches tend to be pretty compressed. 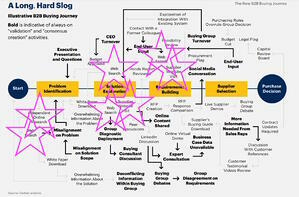 In contrast, B2B searches pass through multiple phases and different stages in buying journey, often over months as this great image from Gartner (via Bob Apollo) illustrates. I've noted each of the explicit web search steps, and believe that many of the others involve web search as well. Content marketing seeks to answer questions that people ask while they search so that content results are served for the search and attract visitors to your site. Buyer intent data seeks to identify the trigger actions to locate active buyers that meet your ideal buyer profile - elsewhere on the web. But the series of searches along the search journey have been only loosely related to this point. Search is personalized (although it's reported to be less so now) based on Google's knowledge of you from previous activity. Browsing history and bookmarks provide some tools to help users recreate it. Additionally, Google is introducing new changes to search related to improving researching a topic online over the course of multiple days. Nick Fox, Google’s vice president of product at its search division, detailed how it’s going to work by breaking down the changes into three categories: journeys, collections, and topics. With the first feature, Google will work to show you previous searches you’ve made right in your search box. Fox talked about how Google is trying to move from “answers” to “journeys.” That sounds very much like standard Silicon Valley doublespeak, but for Fox, it means that users may continue their searches on a topic over a number of days, and Google wants to help users arrive at a suitable destination. “People keep coming back to the same topic over and over,” he says. Given that, Google is now going to begin surfacing parts of your history right in search as an “activity card” that will show you previous searches. It will also surface a card titled “related activity,” showing you sites you’ve previously visited and searches you’ve previously made. 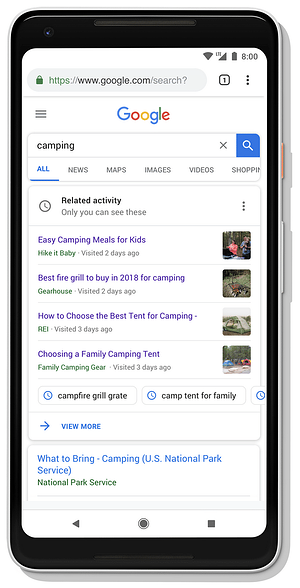 Next is “collections,” which will allow you to bookmark search results into a special viewer where Google will also surface content suggestions. (Think of it like Pinterest, but for Google search.) It’s coming later this fall. Lastly, there’s a new “topic layer” being added to the Knowledge Graph, Google’s database of entities on the web. The new layer will understand more about certain topics like astronomy, and it should help users get to more advanced content as they dive deeper into a topic. The honest answer is of course that nobody knows yet. However, we should be able to begin to anticipate some implications and opportunities. Creating content and answering questions that map to the search journey will likely increase success in collections - both appearing to be bookmarked, but also to "surface as a content suggestion"
Creating detailed, authoritative long-form content may become important for all steps, including the "topic layer"
When will Google start to deliver group results - e.g. for companies which use G-Suite, recognize the association and share history among individuals or amalgamate "collection" results? How will Google eventually display organic vs. paid results in the history and collections? There's going to be a lot to be learned, written, hypothesized and experimented with this. At the very least it ought to be top of the list at your next team meeting!